What greenhouse gases are associated with meat production? Which meats have the highest carbon emissions? Why do beef and lamb have a much higher carbon footprint than other meats? Why does waste account for such a significant part of meat’s climate impact? Does grass-fed beef have a smaller climate footprint than grain-fed beef? Are grass-fed and organic, pasture-based animals less damaging to the environment? How much impact can I have on climate change by eating less meat? Does buying local food reduce my carbon footprint? Other than climate, what are the environmental impacts of meat production? What are the main health effects associated with meat eating? Can I eat less meat and still get enough protein? Is a vegetarian diet better for me? Where do dioxins in meat come from? Why should we be concerned about toxins in meat? What can consumers do to reduce their exposure to toxins in meat? When I eat meat, what do you recommend I look for? Why should I avoid growth hormones such as RGBH in meat and dairy products? Why is grass-fed beef better for my health than grain-fed? Are grass-fed and pasture-raised meats the same as organic? Why does grass-fed meat cost more? Is soy a good alternative to meat? What do the labels “pasture-raised, organic, grass-fed and humane” mean? What is the role of public policy in reducing meat’s impact? How can I find out where meat comes from and whether it’s grass-fed or pasture-raised? Egg cartons make many claims. What do they mean, and which eggs are best? How much meat do Americans consume compared to other countries? Are there any unique concerns for meat-eating kids? Does EWG recommend eating no meat? Why did you select four ounces of consumed food as the functional unit for comparing greenhouse gas emissions? Are the results different if you use protein content as the functional unit? A Life-Cycle Analysis evaluates and quantifies the full spectrum of environmental impacts associated with the entire life cycle of a product, process or activity, including: extracting and processing raw materials; manufacturing, transportation and distribution; use, re-use and maintenance; recycling; final disposal. The LCAs for EWG’s Meat Eater’s Guide calculated the full greenhouse gas emissions associated with 20 popular meat, fish, dairy and vegetable proteins (See page 6 | PDF) – from the fertilizer used to grow animal feed to the processing, transportation and disposal of unused food. The LCAs were done by CleanMetrics, a Portland, Ore.-based environmental analysis and consulting firm. It followed methods consistent with the globally recognized International Standards Organization (ISO) 14040 series and the British Publicly Available Specification 2050 (PAS 2050), a leading standard for life-cycle GHG emissions assessment developed for the British government by the British Standards Institution (BSI Group), the national standards body. The full results from of the LCA analyses are in the methodology document. Ruminant digestion. Through their unique digestive process (called enteric fermentation), cows, sheep and other “ruminant” livestock constantly release substantial amounts of methane – a greenhouse gas 25 times more potent than carbon dioxide (CO2). Pigs and chickens do not emit methane. Feed production. Most U.S. livestock are fattened on soybean meal, corn and other grains that require a great deal of fertilizer, fuel, pesticides and water. When fertilizer is applied to soil, it generates nitrous oxide (N20), which has 300 times the warming effect of carbon dioxide. Manure: Animal waste generates methane and nitrous dioxide. Livestock in confined feedlots generate about 500 million tons of manure a year, three times the waste produced by the entire U.S. population. Pound for pound, lamb, beef, cheese, pork and farmed salmon generate the most greenhouse gases. With the exception of salmon, they also tend to be higher in saturated fat and have the worst environmental impacts because producing them requires the most resources – mainly chemical fertilizer, feed, fuel, pesticides and water. (See the lifecycle graphic) Pound for pound, they also generate more polluting manure. Beef has more than twice the emissions of pork, nearly four times that of chicken and more than thirteen times that of vegetable proteins such as beans, lentils and tofu. Greenhouse gas emissions vary depending on specific production inputs such as fertilizers and pesticide use, differences in soil conditions and production systems and the extent to which growers and ranches implement best practices such as intensive grazing and reduced fertilizer use. The use of these practices improves overall environmental outcomes, but the most effective and efficient way to reduce the emissions and environmental impacts of livestock is simply to produce, eat and waste less meat. Unlike other animals, cattle and sheep produce methane directly in their digestive process,, accounting for the majority of their greenhouse gas emissions. In addition, beef and lamb production is resource intensive, requiring more water, pesticides, fertilizer and fuel than other livestock. That translates into higher emissions per pound of edible meat. In addition, the amount of edible meat per animal is lower than for chicken or pork. Beef and lamb generate comparable amounts of methane and require similar quantities of feed, but lamb generates more emissions per pound because it produces less edible meat in relation to live weight. Also, the life cycle analysis must account for the emissions generated in the course of maintaining mother cows and sheep over many years. All these factors contribute to higher emissions. Why does waste account for such a significant part of meat’s high-climate impact? EWG’s analysis found that discarded food accounts for more than 20 percent of the emissions associated with meat and dairy products. That makes the fertilizer, fuel, pesticides and water used to produce and process them, as well as the resulting greenhouse gases and environmental damage, entirely avoidable. Most of the emissions attributed to waste are generated during production of the food that is ultimately discarded. Methane emitted from discarded food sent to a landfill is a small contributor to post-farmgate emissions because some of it is captured and converted to energy. Reducing waste and buying only as much as you can eat is an easy way to reduce greenhouse gas and other environmental impacts of food. The answer is unclear. There are few definitive studies comparing the net amount of greenhouse gas emissions from grass-fed versus confined-feedlot, grain-fed meat. The climate impact of grass-fed animals depends on factors that vary greatly from one farm to another. Two key factors are: 1) average weight gain and quality of forage (the slower the animals gain weight, the more methane they emit) and 2) rate of soil carbon sequestration. Since grass-fed, pasture-raised cattle gain weight more slowly than animals fed with a high-starch grain diet, they take longer to reach slaughter weight and consequently emit more methane and nitrous oxide. However, these emissions may be offset by the soil carbon sequestration benefits that well-managed pasture systems can provide. In addition, far fewer energy-intensive inputs are used in producing grass-fed beef. Much more research is needed to determine the comparative climate impact of pasture-based versus feedlot systems. Yes, well-managed grazing and grass-fed operations are definitely easier on the environment. They use fewer energy-intensive inputs, and by regularly moving animals to fresh pasture and keeping them away from streambeds, well-managed farms spread manure more evenly and improve the quality and quantity of forage growth. This helps conserve soil, reduce erosion and water pollution, increase carbon sequestration and preserve biodiversity and wildlife. Organic feed production and grazing practices are also better for the environment. They reduce fertilizer and pesticide run-off into waterways, while the use of compost, cover-cropping and rotational grazing helps build healthy, productive and water-conserving soils. Organic methods also enhance pest and weed resistance without the use of chemicals and ultimately foster greater soil resilience in the face of extreme weather and climate change. Just like reducing home energy use or driving less, skipping meat once a week can make a meaningful difference if we all do it. At the same time, keep in mind that although important for improving personal health and reducing your carbon footprint, eating less (or no) meat, by itself, won’t stop climate change or eliminate environmental damage. According to EWG’s calculations, if everyone in the U.S. chose a vegetarian diet – the equivalent of taking 46 million cars off the road or not driving 555 billion miles – it would reduce overall carbon emissions by only 4.5 percent. Other estimates are higher, but not as high as many estimates for the world as a whole. That’s because the U.S. has other, very large industrial sources of greenhouse gases, making meat’s slice of the pie comparatively smaller. Also, U.S. livestock production does not depend on cutting down carbon-rich rain forests in order to import or grow feed crops and raise animals, as is true in Europe (which imports significant amounts of feed from Brazil) or in some tropical countries, where livestock emissions are a much larger slice of the overall emissions pie. While important, it is clear that individual action alone cannot make a big dent in US emissions. It will take political action to bring about comprehensive policies that put us on a path to green energy. Similarly, reducing meat production’s negative impact on soil, air and water quality will require better policies and regulatory enforcement as well as curbing meat consumption. Transportation is responsible for a small portion of meat and dairy’s carbon footprint; it’s a bigger piece of the climate impact of plant proteins and vegetables. Buying local, therefore, significantly reduces the climate impact of vegetables but has less effect for meat and dairy. According to EWG’s analysis, buying locally can reduce the overall footprint by as much as 20 percent for broccoli and 25 percent for tomatoes; local purchasing reduces meat’s carbon footprint by just 1-to-3 percent. Emissions are much higher for airfreighted food. Cheese imported by air, for example, has a 46 percent larger footprint than domestically produced cheese. Salmon imported by air also increases overall emissions by nearly 50 percent. Most imported meat and dairy products, however, are shipped by sea, adding less than 1 percent to their carbon footprint. But buying local can be important for a variety of other reasons, including supporting local family farms, generating local jobs, preserving our farmland and ensuring food security. Other than climate, what are the other environmental impacts of meat production? Growing feed: Excessive pesticides and fertilizers (including manure) used to grow livestock feed often end up as runoff that pollutes rivers, streams, groundwater and oceans with high quantities of damaging nutrients such as phosphorous and nitrogen, creating oxygen-depleted “dead zones” in the Gulf of Mexico, Chesapeake Bay and elsewhere, places where no marine life can survive. Grazing: Grazing livestock deposit manure and trample soil near stream banks, dumping sediment, nutrients and pathogens into waterways, contaminating drinking water and limiting recreational use. The Environmental Protection Agency estimates that roughly 48,000 miles of rivers and streams and 400,000 acres of lakes and reservoirs are fouled as a result of grazing. Confined feedlots and manure: When cows are moved to confined feedlots, they produce massive amounts of concentrated manure – roughly 500 million tons, three times the total of all human waste in the U.S. Pollutants from manure flow into groundwater, lakes, streams and oceans when storage lagoons leak or too much of it is spread on farm fields, leading to fish kills, contaminated drinking water and marine “dead zones.” Contaminants include nutrients (particularly nitrogen and phosphorus), organic matter, solids, pathogens such as E. coli and salmonella, salts and heavy metals, along with antibiotics, pesticides and hormones. Decomposing waste also releases dust, odors and toxic gases such as ammonia and hydrogen sulfide, which can cause itching and dizziness among nearby residents and workers. Animal processing: Slaughterhouses dump millions of pounds of pollutants, including nitrogen, phosphorus and ammonia, into waterways. Nitrates are a significant source of drinking water contamination in agricultural communities nationwide. Eating meat in moderation can be a good source of complete protein and key vitamins and nutrients such as iron, zinc and vitamins B-12, B-6 and niacin. For many, meat is an important part of their diets. However, the scientific evidence is increasingly clear that eating too much meat – particularly red and processed meat – contributes to a wide variety of serious health problems such as heart disease, diabetes, cancer and obesity. Many types of meat are high in saturated fat, which is linked to cancer and heart disease. According to the FDA, moreover, most human exposure to dioxins comes from food, almost entirely through animal fats. The best way to reduce the health risks associated with dioxins and other toxins is by limiting dietary exposure to them. A 10-year Swedish study found that women who consumed more than 3.6 ounces of red or processed meat a day were 42 percent more likely to suffer a stroke than those who ate less than one ounce a day. Scientists at the University of Hawaii found that the risk of type-2 diabetes increased by 43 percent among men and 30 percent among women who consumed the most red meat compared to those who ate the least. Men who ate the most processed meat had a 57 percent higher risk of developing type-2 diabetes and women a 45 percent higher risk compared to those who ate the least. A seven-year study conducted by the University of Hawaii of almost 200,000 people found that those who ate the most processed meats had a 67 percent higher risk of pancreatic cancer than those who ate little or no meat products. The evidence linking red and processed meat to colon and prostate cancer is so strong that the American Cancer Society advises people to limit their intake of these meats to reduce their risks. Yes. Here’s why: Protein intake for most Americans far exceeds the Center for Disease Control’s recommended dietary allowance (RDA) in most age groups studied. For example, the RDA for men ages 19-70+ is 56 grams per day of protein, but the most recent National Health and Nutrition Examination Survey (NHANES) showed that men consumed almost twice as much on average, 88.3-to-109.2 grams per day. Also, there are healthier proteins readily available, including lentils, beans, tofu, nuts/nut butters and whole grains. Meanwhile, only 1 percent of children and 4 percent of adults eat the recommended daily intake of fruits and vegetables. Making meat a side dish, not the main meal, is a healthier approach. Vegetarian diets may not be for everyone, but some research suggests that cutting out meat may be good for your health. A number of studies have found that people who eat vegetarian diets have lower rates of chronic disease and often live longer than those who follow predominantly meat-based diets. The American Dietetic Association, the world’s largest organization of nutrition experts, maintains that vegetarians are less obese and have lower rates of chronic medical conditions such as heart disease, diabetes and hypertension. Most Americans aren’t going to give up meat entirely, of course, but it is not difficult to cut down a bit. Some research has shown that a diet abundant in plant foods along with small servings of lean meat and seafood confers many of the health benefits of a purely vegetarian diet. Where do dioxins in meat and dairy products come from? Dioxins or dioxin-like compounds (DLCs) – such as polychlorinated dibenzo-para-dioxins (PCDDs), polychlorinated dibenzofurans (PCDFs) and certain dioxin-like polychlorinated biphenyls (PCBs) – are generated by industrial processes, including fuel and waste burning and incineration, pesticide and herbicide production, smelting and chlorine bleaching of paper pulp. DLCs end up on plants (including feed), soil, sediments, and water and build up in animal fatty tissues, sometimes to high levels. Why should we be concerned about toxins in meat and dairy products? Most human exposure to dioxin-like compounds (DLCs) comes from the food supply, 95 percent of it from the fat in meat, dairy, fish and shellfish. Both the World Health Organization’s International Agency for Research on Cancer and the U.S. Department of Health and Human Services’ National Toxicology Program consider dioxin a human carcinogen, and the U.S. EPA estimates that the lifetime cancer risk from dioxin-like chemicals (DLCs) for the general public is as high as 1 in 1000. Because these compounds are highly stable and lipophilic (fat loving), they remain in the body for between seven and eleven years, affecting a host of organs and systems. DLCs are associated with a number of toxic reactions including dermal toxicity, immunotoxicity, reproductive and developmental deficits, endocrine toxicity and tumors. The National Academy of Sciences found that DLCs might also contribute to thyroid dysfunction, lipid disorders, neurotoxicity, cardiovascular disease and metabolic disorders. Most of the data from epidemiological studies comes from people who were occupationally and accidentally exposed at much higher doses than occurs through meat consumption, and the toxicity of the various complex mixtures of these compounds in food and human tissue is not fully understood. We do know, however that the developing fetus is especially sensitive to the effects of DLCs. What can consumers do to reduce their exposure to toxins in meat and dairy products? Grass-fed or pasture-raised meat (often labeled “free-range”): has fewer antibiotics and hormones and in some cases may have more nutrients and less fat; the animals live in more humane, open, sanitary conditions. Lean cuts: less fat will likely mean fewer cancer-causing toxic chemicals in your body. No antibiotics or hormones: less unnecessary exposure, helps keep human medicines effective. Certified organic: keeps pesticides, chemical fertilizers and genetically modified foods off land, out of water and out of our bodies. Humane Certifications: Animal Welfare Approved, Certified Humane, Global Animal Partnership and Food Alliance Certified ensure that animals were raised humanely with enough space for natural behaviors and without growth hormones or antibiotics. Unprocessed, nitrite-free and low sodium: avoid lunchmeats, hot dogs, pre-packaged smoked meats and chicken nuggets. Seafood: avoid airfreighted fish and most farmed salmon. Consult Monterey Bay Aquarium’s list of the most sustainable seafood choices. Why should I avoid growth hormones, such as rGBH in meat and dairy products? The use of hormones in meat is banned in most European countries, Australia, Japan and New Zealand and not permitted in U.S. pork or poultry, but they are commonly administered to U.S. beef cattle, dairy cows and sheep. Dairy cows, in particular are treated with recombinant bovine growth hormone (rBGH), also known as recombinant bovine somatotropin (rBST). Both appear on milk labels. rGBH is a genetically engineered hormone, approved by the FDA in 1993, that artificially increases milk production by 10 to 15 percent when injected into cows. There are health concerns for both cows and humans exposed to the drug. Residues of artificial hormones widely used to promote growth in beef cattle, dairy cows and sheep may increase the risk of cancer in humans and cause higher rates of infection in animals. Many studies have found increased risk of breast, prostate and colorectal cancer associated with increased levels of IGF-1 (insulin like growth factor-1) in blood and serum. Further, rBST-supplemented cows suffer more frequent and severe cases of mastitis, which requires more antibiotics. To avoid hormones in dairy products, look for the rBGH-free label or buy organic. A considerable number of studies show that grass-fed beef has less fat and more nutrients than the far more common and less expensive grain-fed meat. Various studies have found that grass-fed beef has: lower total saturated and monounsaturated fat; more heart healthy omega-3 fatty acids and a lower (healthier) ratio of omega-6 to omega-3 fatty acids; higher levels of vitamin E, beta-carotene and B-vitamins; and conjugated linoleic acid (CLA), a nutrient associated with lower cancer risk. Eating certified organic and/or grass-fed products also reduces exposure to traces of sub-therapeutic antibiotics and artificial hormones given to conventionally raised animals. Going organic also reduces exposure to toxins from pesticides that can accumulate in animal fat. Not necessarily. Many ranchers who raise “grass-fed” cattle follow good environmental practices and minimize chemical pesticides and fertilizer use. However, some graze their animals on land or feed them hay that has been treated with synthetic fertilizers and herbicides. While organic meat and dairy may come from 100 percent grass-fed cows, some comes from animals that spend part of their time in feedlots eating a grain-based diet, which does not provide the same nutrition benefits as a natural grass diet. Unless the label states that meat is both grass-fed and organic, it may not be. For beef, the best bet is 100 percent certified grass-fed that’s also certified organic. Since organic usually costs more, however, 100 percent certified grass-fed is a good option. On price alone, grass-fed beef is typically more expensive than meat from grain-fed animals. However, the price difference would be smaller if the full environmental and health costs of factory-farmed meat were taken into account and there were greater parity in government support. The government subsidizes corn and soy feed for confined animals but does not generally provide subsidies or other support that could reduce the cost of business for grass-fed operations. Also, it does not force the livestock industry to pay an adequate price for the contamination it causes. Until government policies change, factory-farmed meat will generally remain cheaper than the grass-fed alternative. There are other reasons that grass-fed meat is more expensive. Grass-fed beef is often processed and distributed in smaller batches, costing significantly more per head than processing thousands of animals a day in large slaughterhouses. It is also costly to transport animals to reach distant slaughtering facilities. There is a tremendous shortage of processing facilities, especially those that are convenient to smaller livestock operations and are well suited to process small batches of specialized meat. Additionally, grass-fed cows must be raised for a much longer time to reach full weight than those that are fed a diet of grain, growth hormones and antibiotics to speed growth. The average feedlot steer is slaughtered at about 14 months, while many grass-fed cows live 20-to-30 months, depending on the quality of their forage. Keeping and maintaining ananimal for the extra 6-to-18 months adds to the expense, including the cost of hay to feed the animals over the winter. If you buy less meat overall, you’ll be more able to afford greener, healthier, grass-fed and pasture-raised meats despite their higher cost. To reduce costs, consider food-buying clubs, community-supported agriculture (CSAs) suppliers and whole animal purchases from local farmers (often shared with others). 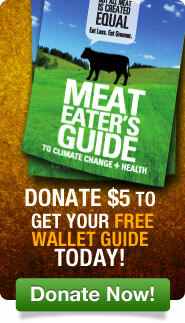 Check eatwellguide.org to find local and direct sources of greener meats. Are soy products a good alternative to meat? It depends. There are many concerns and conflicting studies about the health effects of eating soy protein. EWG has not fully assessed the literature on this issue, but there is consensus that people should not eat too much of it – especially babies and young children. Traditional fermented products such as tempeh and miso made from whole soybeans are the healthiest soy alternatives. That’s because the fermentation process removes the phytates that prevent absorption of important minerals like calcium, magnesium and zinc. Fermentation also reduces enzyme inhibitors that prevent effective digestion of protein, thereby making the beneficial ingredients more available to your body. Soy protein contains isoflavones, a type of phytoestrogen, which bind to estrogen receptors in the body and are known to disrupt endocrine function. Some studies suggest that high levels of phytoestrogens may increase the risk of certain forms of cancer, while other studies suggest they may actually decrease the risk of cancer and help combat menopausal symptoms. Because of the high degree of uncertainty, FDA has declined to classify soy isoflavones as generally regarded as safe (GRAS). Most soy consumed in the US is highly processed and refined with chemicals. The initial process relies on a petroleum-based hexane solvent to extract the soya oil. The de-fatted soybean flakes or soybean meal are then further processed using a variety of chemical solutions and extreme heat and pressure, which turn it into soy protein isolates, soy isoflavones and other soy proteins such as “texturized vegetable protein” used in meat substitute products, including soy veggie burgers or sausages. Because of these chemical processes, soy products may contain traces of carcinogenic substances. They also have higher levels of isoflavones than fermented soybeans. •	Strengthen regulation of concentrated animal feeding operations (CAFOs) to prevent pollution and unnecessary use of antibiotics and hormones. •	Cut taxpayer subsidies for animal feed and instead fund programs that support pasture-raised livestock and diversified, organic crop production. •	Strengthen conservation requirements on farms that collect subsidies and invest in programs that support sustainable agriculture practices in feed and livestock production. •	Serve less meat and more fresh fruits and vegetables in school lunches and other institutional food programs. In its nutrition guidance, USDA should strengthen the message that meat is just one of many good sources of complete proteins. The agency should also continue to stress greater consumption of fruits, vegetables and whole grains. Please take action now to convey to your members of Congress and other officials that you want public policies that support better nutrition and the production of healthier, more sustainable meat. Read the label, ask your grocer or visit the farm. Buying direct from a farmer can be an option, too. Most meat in this country comes from factory farms. Check eatwellguide.org to find local sources of greener meats. Egg cartons make many claims. What do they all mean and which are best? Trying to buy the greenest, healthiest eggs can be confusing when there are so many different terms on the carton: cage-free, organic, omega-3 fortified – to name a few. See EWG’s Decoding the Labels page for more information. Americans consume more meat than people in most other developed nations. In 2009, the U.S. produced 94 kilograms (208 pounds) of meat per person for domestic consumption, not including seafood. That’s nearly 60 percent more than Europe (61 kg, or 134 pounds per person) and nearly four times as much as developing countries. Children’s bodies are more sensitive to environmental toxins because they are small and rapidly developing. EWG’s recommendations for meat and dairy products are the same as for adults, but a bit stronger given the relatively higher risks. We recommend that kids eat no food with added hormones (rGBH). Organic milk is readily available and not much more expensive than conventional. This is an important question, since the results vary depending on the choice of unit. We had a lively debate at EWG before we decided to base the calculations on four ounces of consumed food. We chose it because most consumers can relate to weight and it is easiest to describe. Consumers shop for meat by the pound, half-pound, etc., and typically consume around four ounces at a sitting. That’s about the size of a typical hamburger. Moreover, most people do not know how much protein they are purchasing or eating. For comparison purposes, however, we did look at the emissions footprint based on protein content. We chose 28 grams of protein as the functional unit because that is about the amount in a quarter-pound burger. Interestingly, the results were quite similar to the calculation based on weight. 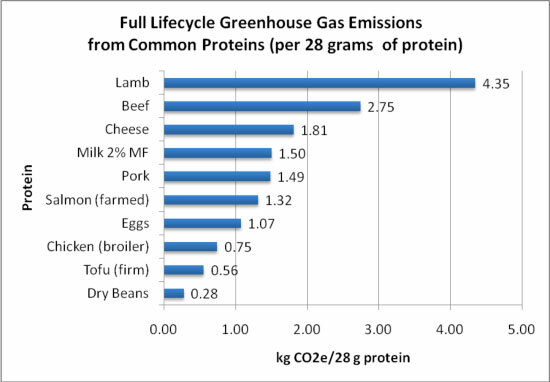 The chart below shows how common proteins compare when greenhouse gas emissions are measured per 28 grams of protein content. The most significant difference from the results reflected in the Meat Eater’s card is milk’s significantly higher emissions in carbon dioxide equivalents. Measured by protein content, not weight, milk moves up from having the lowest emissions to having the fourth highest. Also, chicken shows up as having lower, not higher, emissions than eggs. Salmon becomes slightly less greenhouse gas intensive than pork, whereas their emissions are almost the same when calculated by weight.